The Wheelchair Lifter raises and tilts your wheelchair horizontally, all at the touch of a button! 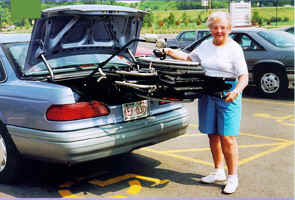 You no longer need to struggle to get a heavy manual wheelchair in and out of the trunk of the car.. 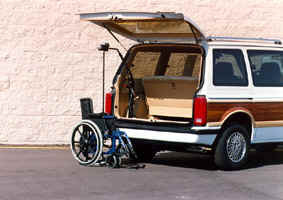 The model AWL-125 can also be modified to raise the wheelchair vertically for storage in a full size or mini van. This lift will tilt the wheelchair as it raises into the horizontal position for your guidance. Can be used in most car trunks, station wagons and hatchbacks. This lift is eligible for reimbursement as adaptive equipment under the mobility programs for Ford, GM and Chrysler.